From the days of sitting around and listening to the radio until today, country and gospel music has been a major part of Tommy’s life. At the age of seventeen, the year 1944, Tommy joined the United States Navy. During this time his father, John Riddle, bought him his first guitar. Inspired by Eddy Arnold on the Grand Ole Opry, he taught himself to play the guitar and write his own music. He trained his voice and writing style to be like that of Eddy Arnold. At the point he felt he was ready, he formed his first band, the Tomahawk’s, and started performing at clubs in the Norfolk Virginia area. After his discharge from the navy in 1946, he worked a day job at National Linen Service in Norfolk and performed at clubs all over, what is now know as, the Hampton Roads area. In the early 1950’s, performed shows from the Norfolk area to Nashville TN for a new area radio station. At this radio station is where he met Bill Davis. Bill took Tommy under his wing and help guide Tommy though the music business. 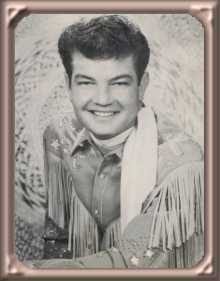 Bill Davis at that time went by the name of “Sheriff Tex Davis” and was the manager of recording artist Gene Vincent. He was the entertainment manager for the radio station and was responsible for bringing the Grand Ole Opry shows to the, now gone, Norfolk Arena. Tommy’s band was given the opportunity to open for these shows and to play for any of the Nashville stars that needed a band. During this time, Tommy performed with now legends and pioneers, just to name a few, Norman Phelps, Charlie Daniels and Garland Abbott. He met the man that much of his inspiration came from, Eddy Arnold. Eddy gave him a lot of hope. He went on to appear on the radio station “WSM” with the Earnest Tubb show three times. Tommy’s writing talent grew throughout this time. He became a writer for B.M.I. and went to Nashville to record his songs. County songs such as “Starlight Starbrite” “Papa Papa Da Da”, “Number Nine Stone”, “Something Special Someone”, “Good Bye Tear Drops”, “Live With the Blues”, “Musical John”, “Bloods Thicker Than Water”, “World of Beauty” and “Love Ain’t Love Till You Give It Away”. His songs were on labels Train Records, Spin Records and Starday Records. In the early 1980’s, Tommy wrote and recorded his only gospel album “Jesus is Here By My Side” on Eddy Crooks Label “Harvest Records”. Among many classic gospel songs, Tommy included his own work on this album, titles such as “Jesus is Here By My Side “,” Everyday “,” Me and My Guitar” and “A New Creature”. All of Tommy’s songs were published with B.M.I. In 1962 Tommy married Phyllis Lewis, of Portsmouth, Virginia. Shortly after they had two children, Robin and Rodney. Along with two children from previous marriages, Debbie and Tommie Jo, they now have 7 grandchildren, Brett, Christopher, Nicholas, Melissa, Brittany, Ryan and Brandon. In the early times of country music it was hard to balance a family and the demands of performing every night. Even with a lot of accomplishments and success, Tommy’s love and dedication to his family gave and even today gives him the strength and focus to provide the best possible life for his family. s.
In 1989, Tommy retired as a crane operator. Today he is working for a well know security agency as a captain. With the help of his son, Rodney, and today’s technology all of his songs have been compiled and recorded to a compact disk (CD) titled “Papa Papa Da Da”. His music can be heard on the station that plays all of the classic country, “The Goldmine” AM 1490, radio station manager Big Bad John McIntyre.